Just like the saying, when it rain - it pours. However, this is happening on our country very literally, and unfortunately - in an undesirable way. Just as the series of destructive Bagyong Labuyo and Maring hit the country and the continue disturbance of the Southwest Monsoon or Habagat, another Low Pressure Area (LPA) was spotted inside the Philippine Area of Responsibility (PAR). Some are listener, some are reader, so if you need the transcript of Philippine President Benigno PNOY Noynoy Aquino III's press conference regarding the propose abolishment of PDAF - Pork Barrel, see the transcript below in English. Some are listener, some are reader, so if you need the transcript of Philippine President Benigno PNOY Noynoy Aquino III's press conference regarding the propose abolishment of PDAF - Pork Barrel, see the transcript below in Filipino / Tagalog. Amid controversies regarding the abuse of the Priority Development Assistance Fund (PDAF), popularly known as Pork Barrel, Philippine President Aquino had called an immediate press conference to announce his support to abolish Pork Barrel funds of government officials. If you missed the said press conference or you just simply want to watch it again. Below is the video replay of President Aquino's press conference regarding abolition of the pork barrel. Bagyong Maring has been declared to had exited the Philippine Area of Responsibility (PAR), that is according to the weather bulletin of the Philippine Atmospheric, Geophysical and Astronomical Services Administration (PAGASA) earlier today at around three in the morning. The Philippine Atmospheric, Geophysical and Astronomical Services Administration (PAGASA) had officially declared Bagyong Maring to have crossed the border of Philippine Area of Responsibility (PAR) today. Here's a good news amidst this heavy rains. Michael V is recovering from dengue, the comedian announces on his instagram account. Bagyong Maring continues to add destruction on the entire country as it climbs on the eastern part of the Philippines. At 4:00 a.m. today, August 18, 2013, the Philippine Atmospheric, Geophysical and Astronomical Services Administration (PAGASA) said that the Tropical Depression "Maring" was estimated based on satellite images and surface data at 470 kilometers East of Itbayat, Batanes (20.4°N, 126.9°E) with maximum sustained winds of 55 kilometers per hour near the center. It is forecast to move East at 9 kilometers per hour. Meanwhile, below is the latest satellite image as officially released by PAGASA today. Here's the update from the Philippine Atmospheric, Geophysical and Astronomical Services Administration (PAGASA) regarding the weather disturbances that affects the entire country. 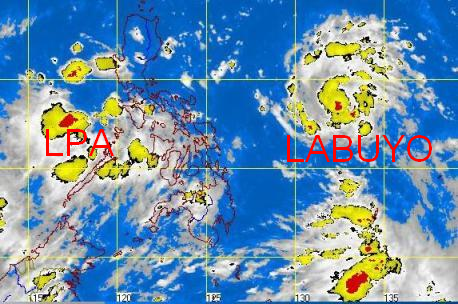 According to PAGASA, there are two weather disturbances that is currently within the Philippine Area of Responsibility. At 4:00 p.m. today, PAGASA said that the Tropical Depression "LABUYO" was estimated at 875 kilometers east of Bicol region (13.8°N, 133.3°E) with maximum sustained winds of 55 kilometers per hour near the center. It is forecast to move northwest at 19 kilometers per hour. Meanwhile a Low Pressure Area (LPA) affecting Palawan and Western Visayas, was estimated based on all available data at 400 kilometers northwest of Puerto Princesa City (12.0°N, 115.5°E). Below is the satellite images released by the weather bureau. At 4:00 a.m. today, the Philippine Atmospheric, Geophysical and Astronomical Services Administration (PAGASA) said that the Tropical Storm "LABUYO" was estimated at 680 kilometers east of Virac, Catanduanes (14.0°N, 131.4°E) with maximum sustained winds of 65 kilometers per hour near the center and gustiness of up to 80 kilometers per hour. It is forecast to move west northwest at 19 kilometers per hour.